After a hiatus, the Ideas Festival is back. On September 9-11th, 2016, we convened a conversation on Housing our Community, echoing the 1989 Festival that helped spur on the region’s initial affordable housing programming. Since then, the region has constructed more than 1,000 units of deed restricted housing that house more than 50% of the local workforce. And yet, many still consider workforce housing to be our biggest issue locally. Early in the process, we determined that management of the ongoing housing crisis will require creativity to diversify unit generation beyond the current methodology that relies primarily on local governments queueing up and developing housing projects. So, we set out to bring together local, regional and international experts who are either actively working in that direction or able to inspire new action in that vein. The festival was structured in three parts. Day 1 focused on laying some background information on the local housing history and existing programs, as well as more general background information, including a talk on affordable housing financing 101 and on psychologically driven architecture. Day 2 was focused on solutions, beginning with reports on active projects around the region, including Jonathan Rose’s keynote on The Well Tempered City ,and moving into smaller group conversations with the Marketplace of Ideas and workgroups led by Marc Nager. Day 3 worked to bring everything back together to maximize buy-in, beginning with a panel of regional planners led by Bill Jensen, TSG CEO, and ending with mayors Sean Murphy and Dan Jansen reflecting on their favorite ideas from the weekend. The results of the weekend will take time to materialize for the most part, but the high degree of buy-in from elected officials, public servants and the lay public suggests a positive outcome. Already, a project proposed by Jeff Badger to bring temporary units to the region by Thanksgiving seems to be moving forward. Additionally, there was much agreement on the value of public/private partnerships following a presentation by Paul Major, Telluride Foundation CEO. The desire for regional collaboration was oft repeated. Many see the need to establish the community’s values as the first step towards masterplanning. A more detailed summary of an action agenda is found below. On this aenda, we have highlighted the projects that do not have clear champions. These are potential openings for future action. However, projects that already have champions are also likely to need support and coordination. Moving forward, the Telluride Institute needs to determine what roll we should play in the ongoing housing conversation. It has been proposed that we should work as a neutral source of information and encouragement in the vein of the Women’s League of Voters. But there are other potential avenues for action. We request that the board determine the most prudent strategy, and then set goals, a timeline and define the roles that board members and staff might play. One specific decision to keep on the radar is what to do, if anything, with the footage captured by Telluride TV during the festival. At the same time, we ask that the board look towards next year’s Ideas Festival. The same date has been reserved on the CCAASE calendar. A topic needs to be set, as well as staff and a timeline. 1. Regional planning discussion/regular meetings – wholistic planning – SMC could take the lead? Include aspects of aging population + artists, teachers, first responders (community glue?). What values do we share and where do our values differ? 3. Develop a regional Housing Trust – Amy Levek working on this. Supersize RHA within 6 months to address issues, including improve website or create something new specifically to address current needs. Telluride’s almost-half-century of success in remaking itself from a mining economy into a resort economy is in great part because we have such strong, participatory community values, but that very success has been undermining our community by pricing out locals from living locally. 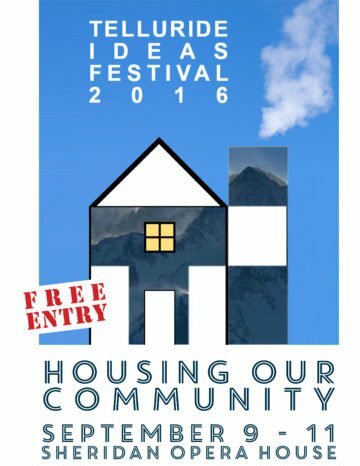 In the 2016 Ideas Festival Housing our Community the public is invited to bring their thoughts and energy to a weekend full of conversations, talks and panels with leading local and national experts in planning, architecture, sustainability, and financing. Jonathan Rose will present the Keynote Address. Rose has worked nationwide on numerous affordable housing, workplace and transit projects, over nearly 25 years. Jonathan Rose Companies (http://www.rosecompanies.com) is a multi-disciplinary real-estate planning, developing and investing firm that aims to “repair the fabric of communities,” by working with cities and nonprofits to build housing, health, cultural and educational infrastructure. Rose’s appearance coincides with release of his new book The Well Tempered City: What Modern Science, Ancient Civilizations, Human Behavior Teach Us About the Future of Urban Life, and will be the first stop on a nationwide promotional tour. The Ideas Festival will approach the interconnected challenges of housing and planning in Telluride and the surrounding region in the style of a “BioBlitz”, bringing diverse thoughts and expertise together to generate energy and form a plan for concrete action. Beginning Friday, September 9, experts will lay a base for collective knowledge with briefings covering the scope and history of our communities’ housing efforts. The voyage will continue through the weekend with presentations on projects around the world, ongoing efforts in and near our box canyon, and potential futures. By the close on Sunday, we expect to generate a series of short-, middle- and long-term action plans for public and private groups throughout the region to move forward together to address our communities’ needs. Public participation in the conversation is critical to the process. This year’s Ideas Festival will have a vivid, inclusive, memorable and entertaining style, making use of our successful past format including lectures, panels, debates, the Bureau of New Mistakes, the Marketplace of Ideas, and more, and will provide everyone the opportunity to share their ideas with the festival as a whole. It’s 31 years since Telluride Institute introduced the Ideas Festival, since imitated by The Aspen Institute and others, to foreground issues we consider to be of current concern, whether local, national or global. In 1989, twenty-seven years ago, we put on the original Ideas Festival called Housing our Community, which proved a catalyst in pulling together regional interests in affordable housing. Before this Ideas Festival there were 8 units of public housing in the region; five years later 50% of our year-round residents were living in deed restricted housing. This was a huge victory for the community and showed what can be done when all the stakeholders have the vision and energy to work together. Now, in 2016, we have another crisis of community housing. Our local governments struggle to provide a steady supply of housing that matches demand and affordability. The private sector struggles to find ways to participate. New housing forms, like tiny housing, can’t meet land use code standards. Undeveloped private land in the region is running out and getting more expensive. New construction technologies could be embraced but we don’t know how. Passive House design can create net zero energy homes if can it be afforded. Local businesses are damaged because they can’t find employees who already have housing. But we can create solutions! Housing our Community will open Friday evening, September 9, at the Sheridan Opera House, continue all-day Saturday September 10, and conclude Sunday afternoon, September 11. Admission is free but online seat reservations may be made starting in early June, because space is limited. Those with particular interest or expertise are encouraged to contact Kris about participating at a higher level, and those with active or potential housing projects are encouraged to contact Alec for protocols to submit a white paper and present at the festival.